You may need to slow down to country speed as you find you're suddenly sharing the road with farmers. Access is made easy by following the Fleurieu Way. It gets you quickly to the major coastal towns that serve as bases for further exploration. But the roads winding inland across the Peninsula provide a different experience, crossing permanent rivers and leading to 22 pristine conservation parks. For a specific experience you could easily take a South Australia Road Trip. You may need to slow down to country speed as you find you're suddenly sharing the road with farmers, their machinery, cows or sheep. You pass roadside stalls with fresh free-range eggs or strawberries, to country towns with bakeries that can't be ignored. Look for the unexpected. Try turning left instead of right and be prepared to lose yourself on the back roads as you relish the beauty of the region. The Fleurieu Way is an interpreted drive around the Fleurieu Peninsula. Pick up a copy of The Fleurieu Way brochure from information centres. It includes maps and a series of local tourist routes that collectively present some of the most spectacular and rewarding ways to experience the Fleurieu Peninsula. There is the Hills and Seascape Discovery Trail through the Yankalilla district, the McLaren Vale Wine Trail, the Hills and Lake Drive around the Strathalbyn, Milang and Clayton area, the South Coast Drive around Port Elliot, Middleton, Goolwa and to the Murray River mouth, and the Victor Harbor Highlights Trail. Each of these drives takes you through some of the rich farmland areas where farm gate produce and other hands-on food experiences are available. Download The Fleurieu Way map (PDF 323 KB). South Australia Roadtrips are now available in 5 self-drive itineraries. Epicurean Way - Australia’s great food and wine touring route. Explorer's Way - Journey through the heart of Australia’s outback. Mighty Murray Way - Follow the journey of Australia’s largest river. Seafood Frontier - A smorgasbord of nature’s generosity. Southern Ocean Drive - The great southern journey. Adelaide to Melbourne - Stunning coastal drive through the Fleurieu & Limestone Coast en route to Melbourne. For details on the touring routes go to South Australia Road Trips. Heading toward Tailem Bend from Meningie, turn left to Wellington and enjoy a 3 minute break from driving aboard the free car ferry across the River Murray. In summer, delays can be expected so don't be in a hurry. Inspect the Wellington Courthouse Museum before driving on to Langhorne Creek with vineyard cellar doors open seven days per week. As an interesting side trip, follow the signs south to Milang, on the shores of Lake Alexandrina, Australia's largest fresh water lake with yachting and fishing opportunities. Continue on into Strathalbyn, a charming 19th century Scottish town, complete with village green, ducks on the river, rose gardens, and a delightful picnic spot. Don't miss High Street where over a dozen antique and art/craft shops tempt the discerning buyer. A full range of accommodation, fuels and 24 hour banking is available. Head south towards Goolwa. Look out for the scarred Aboriginal "canoe-trees" on the roadside near Currency Creek. The River Port of Goolwa is on the lower River Murray. Mucking about in wooden boats has been a way of life here for many years and wood fired paddle steamers offer cruises from the wharf. Steam trains have run here since 1854, Australia's earliest railway and early colonial architecture feature strongly in the present day town. River cruises ply into the nearby Coorong National Park where birdwatchers, campers and walkers enjoy the pristine surrounds. The Signal Point River Murray Interpretive Centre provides a comprehensive story on the significance of the Murray to Australia and its people. A full range of accommodation and fuels is available. Middleton is a town known for its surf beaches, its fishing and winter sightings of the Southern Right Whale. Kite flying and a shared, sealed path between Goolwa and Victor Harbor is popular for roller blades, skates, bikes and walkers. A few kilometres along the coast is the charming village of Port Elliot. Take time out for a coffee or browsing along The Strand, a shopping precinct full of interest. Don't miss Horseshoe Bay or the lookout at Freeman Nob. A full range of accommodation is available. Victor is the birthplace of South Australia's tourism industry. Set in the wide sandy arc of Encounter Bay, with its beaches, the shopping arcades and attractions long favoured by Adelaide families. Take the horse drawn tram across to the penguin colony on nearby Granite Island. Visit Urimbirra Wildlife Park, the Wild Rose Cottages, Greenhills Adventure Park or Nangawooka floral reserve. There is an historical display at the Encounter Coast Discovery Centre. Ride the Cockle Train between Victor Harbor, Port Elliot and Goolwa or ride a camel. From June through to October, look for whales from on top of the Bluff or just admire the 270 degree views along the coast. Drive into the nearby Inman Valley, with its majestic roadway lined with huge gums, to view Glacier Rock, discovered in 1859 and one of the largest glacial exposures in the world that attracts geologists from all over. Or alternatively take the Adelaide Road to Mount Compass for wine tasting and seasonal roadside berries. A full range of accommodation, fuels and 24 hour banking is available. Take the Range Road west from Victor Harbor. Detour to Waitpinga Beach and the Newland Head Conservation Park and take the time to walk along its beaches. At most times of the day, Grey Kangaroos will be seen on the hills behind the beach. Head into Deep Creek Conservation Park, with its spectacular coastal scenery, its abundant wildlife, camping and bush walking opportunities. The nearby Talisker Conservation Park is well signposted and tells of early Cornish mineral exploits. At Cape Jervis, vehicle and passenger ferries leave each day for Kangaroo Island. Summer time bookings are essential. The town of Cape Jervis offers good boat, jetty and beach fishing, and has a range of accommodation and fuels. Ocean views from the township are superb. As you leave the Cape, enjoy the views from the Lookout on Sappers Road. A side trip into Rapid Bay is worth the time. You are at the point where Colonel William Light first stepped ashore to establish the colony of South Australia. He recorded the event by carving his initials and the date into a boulder, still on site. At Second Valley, another side trip down to the coast provides dramatic cliffscapes, great jetty fishing and interesting geology. The area is also a popular scuba and snorkelling location. Just north is the State's premier four star resort, Paradise Wirrina Cove, offering travellers a range of accommodation styles and standards, luxurious facilities and a range of activities, including bush walking, golfing and a 350 berth marina. A heritage-listed sand-dune system indicates your arrival at Normanville, with beaches, snorkelling and fishing on inshore reefs. Nearby the town of Yankalilla nestles in the Bungala River valley with the rich surrounding dairy pastures a reminder of the town's agricultural focus. The town boasts an interesting agricultural museum, the Shrine to Our Lady of Yankalilla, within the Anglican Church and the first schoolhouse used by Sister Mary MacKillop. A range of accommodation and fuels is available. If a short section of formed gravel road is acceptable, head to Myponga via Carrickalinga. The views from the hill tops are some of the most spectacular in the State. Alternatively take the main road north. Gently rolling hills, grazing sheep and cattle country and old gum trees provide an attractive drive north. Keep a look out for seasonal specialist nurseries, offering displays of roses, begonias and native flora. The highway strikes the coast in spectacular fashion at Sellicks Beach with magnificent views from the steep hillsides of the Southern Mount Lofty Ranges. At Aldinga Beach and Port Willunga, coastal scenery warrants regular breaks in your journey. At Willunga, slate mining was an early industry, still evidenced in local roofs, footpaths, fences and bridges. The annual Almond Blossom festival, in late July, reflects the importance of this industry. Historic buildings dating back to the 1840s and the Courthouse Museum make an interesting diversion. A range of accommodation and fuels is available. The vines start to appear on all sides. McLaren Vale has been synonymous with fine wines for over 150 years. South Australia's first vineyard was established at Old Reynella in 1838. The area has 42 wineries with cellar doors and many are small family concerns where the notion of "meeting your maker" reflects the opportunity to discuss bouquets, cellaring potentials and other vital information as you taste. 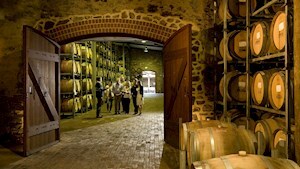 The wineries offer quality aromatic whites that include Riesling, Sauvignon Blanc, full bodied Chardonnay and Semillon. Undoubtedly, the region is best known for its rich, robust reds, in particular its Shiraz. The beauty of the surrounding hills, the pristine beaches and rugged coastal scenery has inspired artists to paint here for many years. Their works are found in a number of galleries in the district. The Fleurieu Biennial, Australia's foremost landscape art prize is a feature of the district. North of McLaren Vale is the Onkaparinga River; its estuary provides significant bird watching opportunities while its gorge provides walkers and canoeists delightful outings. The historic village of Old Noarlunga is sited at the head of the gorge and a swing footbridge provides access to the Onkaparinga River National Park. The river meanders widely across wetlands with a boardwalk facilitating visitor access. There are a number of coastal beachside towns leading towards Adelaide that include Moana, Port Noarlunga, Christies Beach and then into the suburbs of Adelaide. The Fleurieu Peninsula straddles the main coastal route between Melbourne and Adelaide – Coastal, Explorer's Way and is adjacent to the inland Country Lover's Way. This is one of the most compelling journeys in Australia. It includes some of the very best of coastal and inland driving - the Great Ocean Road, the wineries of Coonawarra, Langhorne Creek and McLaren Vale, World Heritage-listed Naracoorte Caves and stunning national parks at Cape Otway, Grampians, Coorong, Deep Creek and the natural wonders of Kangaroo Island. The towns of Apollo Bay, Lorne, Port Fairy, Mt Gambier, Robe, Goolwa, Victor Harbor, Mannum, Penola, Hamilton, Halls Gap and Ballarat are there to provide for your accommodation and service needs and there is a free Melbourne to Adelaide Touring Map available at information centres en route. More information about Melbourne to Adelaide Touring Route. 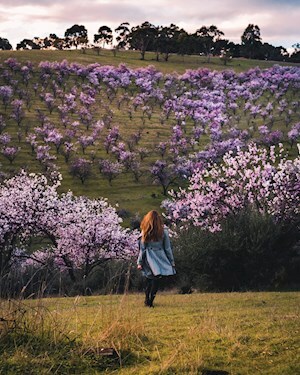 The Fleurieu Peninsula is home to some of the best wines and most famous wine regions in the world including Langhorne Creek Wine Region and McLaren Vale Wine Region.